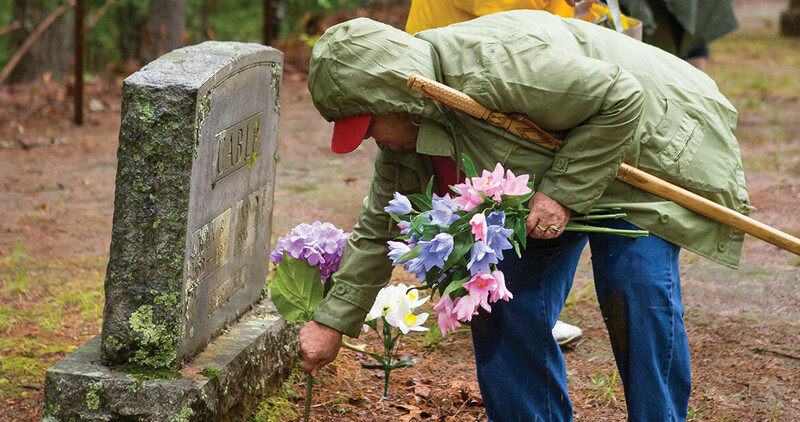 Every year, an old family cemetery tucked in the woods on the northern shore of Fontana Lake becomes a gathering place. One woman, whose parents and grandparents worked this land, returns to ensure that a Southern mountain tradition carries on — rain or shine. The rain has turned the May air cold and the ground slippery. Men and women carefully shuffle up metal ramps onto a pair of pontoon boats. Water beads on the vinyl seats, and droplets pool on the laps covered by plastic ponchos. Coolers and casserole dishes are stowed away. Bagpipes sit, silent. One man has brought two metal dowsing rods, to help find unmarked graves. The boats pull out of Cable Cove, toward the gray opening in the green valley, where Fontana Lake spreads out in all directions and to a depth, on average, of 130 feet. The surface is rippled but calm. What lies beneath is murky. Fifteen minutes later, with the rain alternating between shower and mist, the boats find the place where that old cemetery road rises out of the water, in another cove on the north side of the lake. Park rangers stand in a small opening in the brush, helping people find their footing and pointing them up the muddy trail, which runs a quarter-mile to the top of a ridge. This place is only reachable by boat, and most of the people who visit are getting on in age. Helen’s sisters are here. So are her son and daughter, and a few dozen other people, all talking like old friends, walking up the hill toward their ancestral graveyard, their voices high and happy over the sound of raindrops tapping on leaves. “It’s like coming home,” Helen says. The water has always made things tougher here. When it rains in Great Smoky Mountains National Park — and it does, often; in the wet years, some peaks get eight feet of rain — the trails turn into muddy slides, the creeks brim, and the white noise the waterways create rises in volume. Rutted roads become more deeply grooved. Cotton shirts and blue jeans feel perpetually damp. When the rain does stop, droplets still slide off of leaves and pitter-patter all around until, if luck has it, the sun comes out enough to evaporate the last of it. Until the next shower. There had long been talk of harnessing all that water with a dam. As a child, Helen had heard that it might be done with just a small barrier on the Little Tennessee River. There’d be a lake, but maybe her family could stay. Then came the clues that something much bigger was happening: After Japanese bombs fell on Pearl Harbor, the federal government told all of the copper miners in the hills around Helen’s home to wrap up their operations and leave. In January 1942, bulldozers started pushing dirt and knocking down trees near the village of Fontana, which would eventually be submerged under hundreds of feet of water. The Tennessee Valley Authority already had started buying up land. The Cables had a family farm surrounded by corn fields and apple orchards. In 1943, the TVA paid Helen’s father $8,000 for it. By then, a lot of the people nearby had already left. Helen’s father, Jake, helped pour the concrete on the 480-foot-tall dam that would eventually flood his land. After his job finished in February 1944, he got a letter from the TVA, telling him that he had 30 days to leave or the sheriff would come and put him out. Jake sold all his livestock, and he and Helen, then 17, started dismantling the family home. They’d use the lumber to build some extra rooms onto Helen’s aunt’s house. Then, in November of that same year, the floodgates were closed at Fontana Dam, and the water started to rise. Hilltops became islands. Hollers became coves. Curious locals fished in the deepening waters. Within months, the lake filled and the turbines started to spin, generating electricity for aluminum smelters — and the scientists working on the atomic bomb in Oak Ridge, Tennessee. But 17 miles of valley were submerged, lost to darkness and memory. By then, the Cables had left the land that had been in their family since 1835 and moved to a small, four-bedroom house in Sylva. Helen kept moving: to Washington, D.C., to Florida, then back to North Carolina, eventually returning to Sylva. She always figured that, someday, she’d be able to go back and see what was left of her family land, thanks to a road the federal government promised to build. But water stopped that, too. In 1971, after seven miles of the road were built along the north shore of Fontana Lake, from Bryson City heading west, someone noticed that snowflakes instantly melted on the newly exposed rock, which gave off the faint odor of sulfur. The Anakeesta rock, now out of the ground, threatened to make the water that ran off of it more acidic, killing life in nearby streams. The road, already expensive, became impossibly so with this new wrinkle, and in 2010, the federal government officially gave up on building it, instead promising $52 million to Swain County. The full amount has yet to be paid out. So the road ends at a tunnel. Locals call it the Road to Nowhere. That road would have made it easy for families to reach the cemeteries that had been cut off by the lake, but with no road, some 28 cemeteries on Fontana Lake’s north shore were in danger of being lost in the wilderness of the Great Smoky Mountains National Park. That is, until 1976, when Helen decided that she’d like to see what everything looked like. 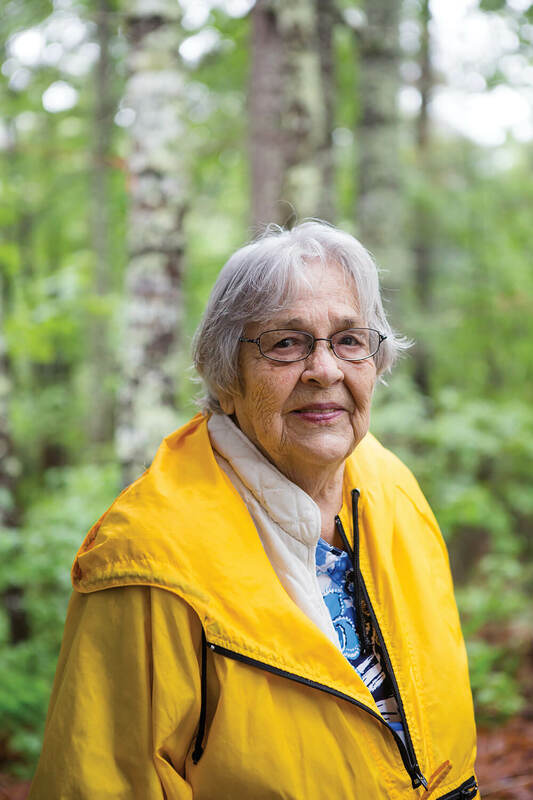 She chartered a boat, and she and a few relatives found Cable Cemetery in the sort of shape you’d expect after 30 forgotten years: overgrown, covered in leaves and brush. A mess. After first convincing the National Park Service (NPS) to clean it up, she and other Cables came across the lake in 1978 to celebrate Decoration Day, an old mountain tradition of honoring the dead by placing flowers on graves, singing spirituals, and sharing a meal. By 1981, Helen and others had persuaded the NPS to pay for the boat trips and, eventually, to take visitors to the other 27 cemeteries, too. Today, boats leave every other Sunday from April to October. Each graveyard gets one visit a year, and that day becomes its Decoration Day. The rain picks up as Helen carefully steps through a gate in a simple wire fence, flowers in hand, her white hair damp, water speckling her glasses. Each grave gets a silk flower with a plastic stem. Except for Samuel Cable, “the main man,” says a woman nearby. Nearly everyone buried here, more than 160 people, is descended from him in some way or other, and his final resting place is covered with dozens of cloth and real flowers, in yellow, orange, and blue. Helen bends, sticks the flowers into the soft ground, and looks at the headstones. Many of the names belong to people she knew. She has four sets of grandparents buried here, as well as a brother, an aunt, and cousins. She was here when they were put in the ground. She remembers the last of the burials: a man and his mother, a week apart. And there was a friend who died at 12 years old. Toward the end, so many people had moved away that it was hard to find anyone to dig the graves. After the pie and ham have been sampled and the conversations wane, Helen reveals that this may be her last visit here. Her health isn’t bad, she says, but it’s not great. Of course, she could come back for eternity, if she wanted to. The last funeral at this cemetery was in 1944, but under the agreement with the NPS, descendants of Samuel Cable still can be buried here. Maybe a few years ago she would have done it, she says. Maybe if other family members were still doing it. Or if it were easier to get here. But not now. Not anymore. It’d be too hard to hold a funeral. People are getting too old. It’s the young people, Helen says, who need to see this place. There was a 2-year-old boy here today, and a teenage girl. 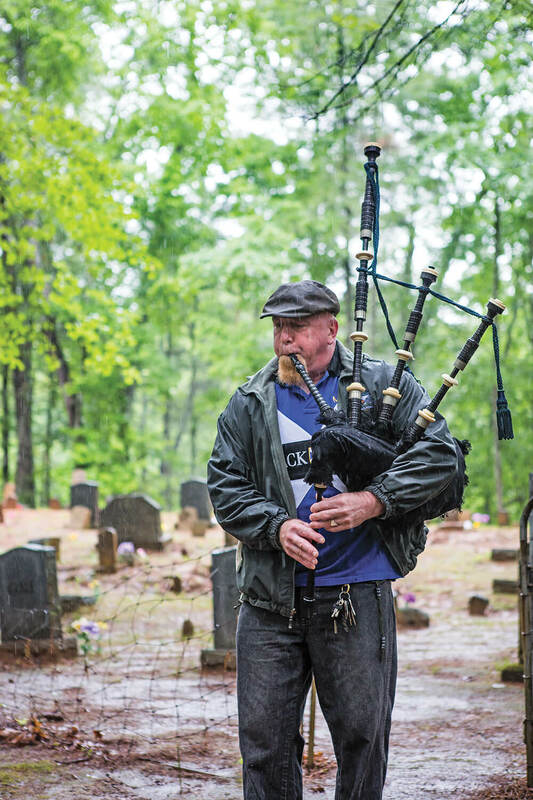 Those who still remember this place as a simple cemetery at the edge of town are dwindling, and their kids and grandkids need to make this trip, Helen says. If they don’t, and the number of visitors declines, she worries that the NPS may stop paying for the boat rides and the upkeep, and that these places will be lost all over again. It’s a tenuous situation born out of a series of broken promises, and Helen could be angry about all of it: About the dam. About the road. Even about the dreary weather. But she’s not. “That’s life,” she says. “You have to accept it as it comes.” After lingering in the cemetery for an hour, she and the others return to the boats. The rain is still falling. Some years, after the Labor Day lake crowds are gone, the TVA lowers the level of Fontana by nearly 60 feet to make room for winter snow and spring showers. Slowly, parts of the old valley emerge in the shallows. Helen’s childhood home is gone, but if you look in the right spot, you can still see the white rocks that outlined her mother’s flower bed. You can find nails pried out of the wood that once made up the Cable house. There are zinc jar lids. Marbles. Porcelain doll parts. The detritus of Helen’s childhood is here. For a moment, the slopes reemerge and the valley is bathed in sunlight. Then the water slowly returns, as it always does, and everything disappears. Listen to our Away Message episode about Decoration Day below.